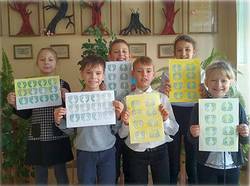 In the Novopolotsk school the 4th grade pupils, 40 in number, took part in this year’s ZOOM campaign and collected together 6,524 "Green Miles". 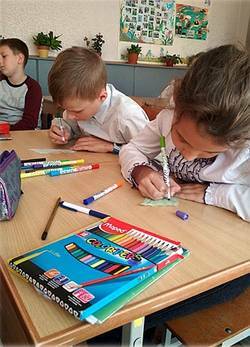 During their days of action, the children learned a lot about climate protection and sharpened their awareness for an environmentally conscious lifestyle. 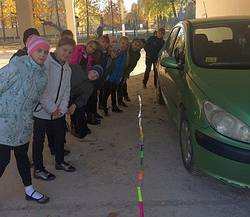 For example, a video on the "Greenhouse Effect" was shown, the cars near the school were counted and the total length of the car "queue" was calculated. In addition, suggestions were collected on how to improve the ecology of the city, a questionnaire was completed and interviews were conducted with the parents and grandparents of the children. It turned out that the grandparents always walked to school, even in winter, and the journey could even take longer than an hour. A "Protect the Earth" campaign was also carried out, distributing posters and explaining to the other students how to protect the planet from further unnecessary CO2 emissions. The collection of "Green Miles" was not only related to the way to school, but also to the ways they covered in their free time. Now they hope that adults and especially politicians will listen to their demands and proposals. The children have definitely done a great job! Keep going.